The beautiful tropical dry forest of northwest Costa Rica, with its highly seasonal rainfall and diversely vegetated landscape, is disappearing even more rapidly than Costa Rica's better-known rain forest, primarily because it has been easier to convert to agriculture. This book, based on more than thirty years of study, offers the first comprehensive look at the ecology, biodiversity, and conservation status of this endangered and fragile region. 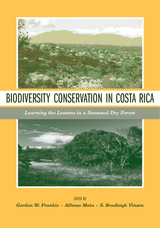 The contributors, from Costa Rica, Britain, Mexico, and the United States, and representing the fields of ecology, environmental education, policy, and the law, examine the major plant and animal groups living in the dry forest and present the first technical evaluation of Costa Rica's conservation efforts. As they assess the status of their area of specialty in the dry forest, the contributors also look beyond this particular region to show how its plants and animals are ecologically and evolutionarily connected to other geographic areas in Costa Rica and Central America. Their chapters cover topics such as watershed and coastal management, plant phenology, pollination, insects, birds, mammals, amphibians, and reptiles. They also consider the socioeconomic, policy, legal, and political aspects of biodiversity conservation, giving the volume a wide-ranging perspective and making a unique contribution to our knowledge of the tropical dry forest. The book concludes with an important synthesis of the contributors' recommendations on future directions, policies, and actions that will better conserve biodiversity in Costa Rica and other neotropical forests as well. Gordon W. Frankie is Professor of Insect Biology in the College of Natural Resources at the University of California, Berkeley. Alfonso Mata is Environmental Science Specialist at the Tropical Science Center in San Pedro, Costa Rica. S. Bradleigh Vinson is Professor of Entomology at Texas A & M University, College Station. "This book is an excellent synthesis of the ecological basis of biodiversity conservation in the seasonally dry forest ecosystems of northwest Costa Rica, as well as a valuable analysis of the effectiveness of conservation efforts in a country renowned for its global leadership in protecting and inventorying biological diversity. "—Gary S. Hartshorn, President and CEO, Organization for Tropical Studies "